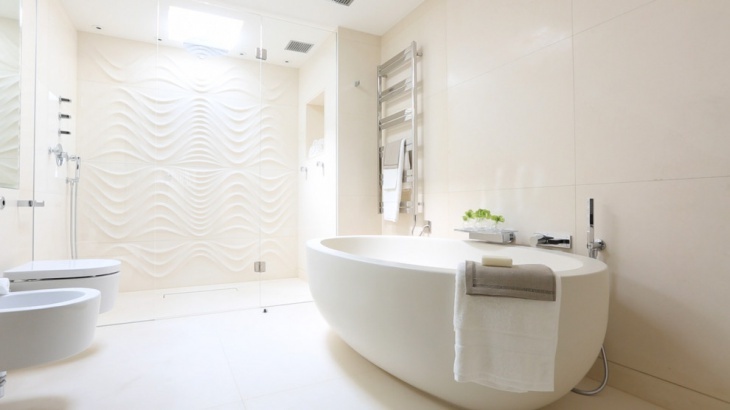 Bathrooms are some of the most personalised areas of your home, and when you opt for a penthouse bathroom, there are different designs and themes to choose from. 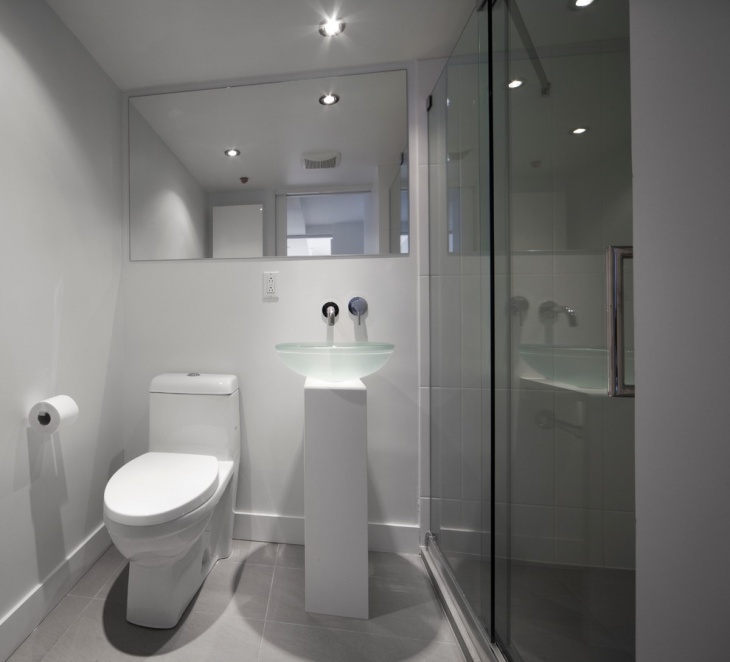 Even if you have a limited area in your home, you are free to customise the small bathroom ideas and make sure that you get all the desired features there. 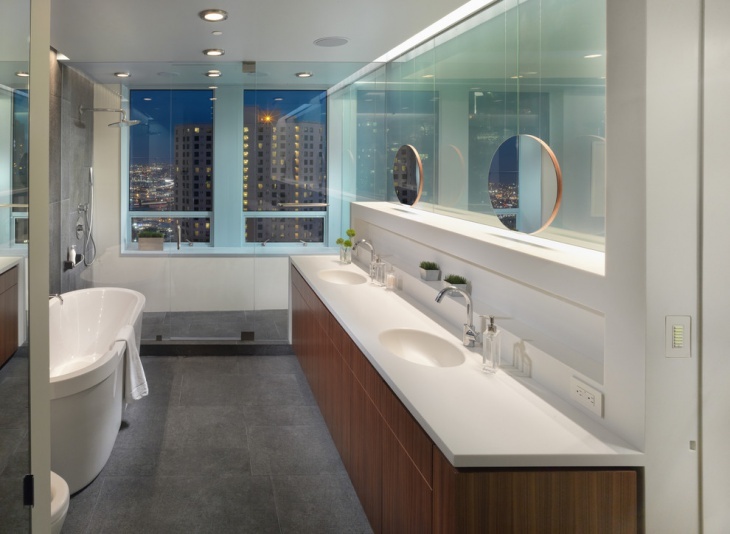 You may feel confused about the right choice of the design and wall colors, so scroll down to find ten classy penthouse bathroom design ideas here. The black and white combination of colors has a great compatibility with bathrooms, and when you have a medium sized bathroom, you can get vertical tiles for the walls. There is a floating mirror in the bathroom and the black tiles on the floor looks contrasting with the walls. There ae many modern homes with trendy bathrooms and medium toned wood cabinets. You can use stained marble tiles on the floor if you opt for this bathroom design. The marble floors complement the bright wall colour in the bathroom. In many contemporary bathrooms, you will come across a narrow passage with grey flooring. There are integrated sinks along the sides. There are tub and shower enclosures as well. Fix round pendant lights along the ceiling so that the overall setting of the bathroom looks beautiful. Houses with luxurious bathrooms opt for freestanding vanities with tops. You can get the walls painted in cream color so that the setting looks compatible to the lighting. 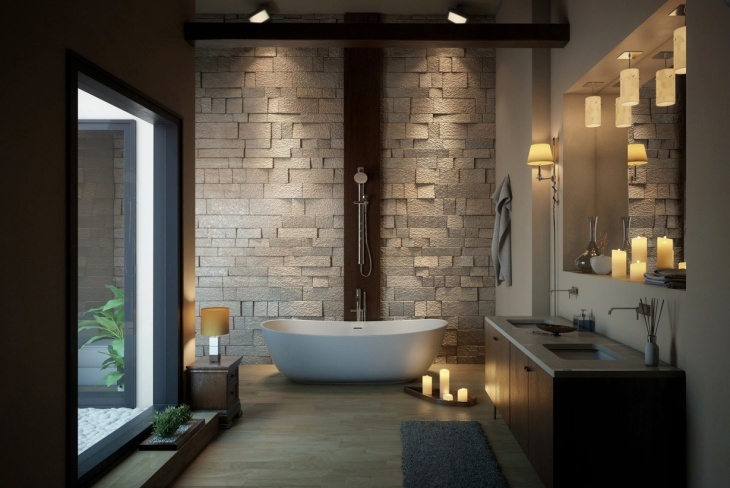 Elliptical tubs and other accessories are ideal for the bathroom. 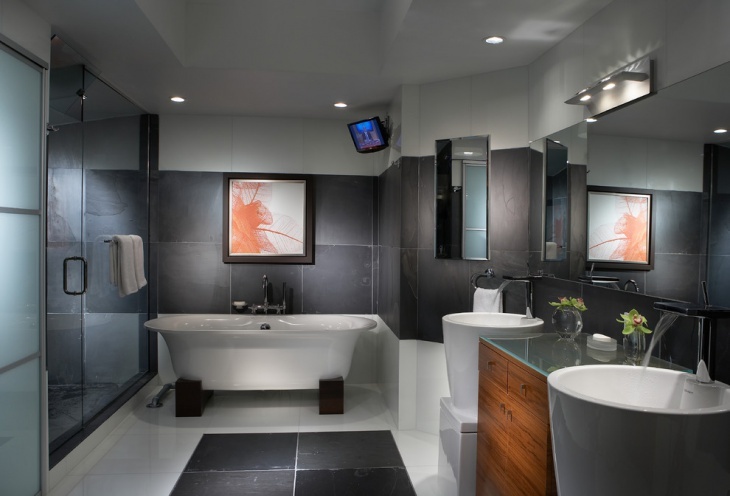 Many of the modern bathrooms have two-toned walls, with the perfect incorporation of grey and other shades. 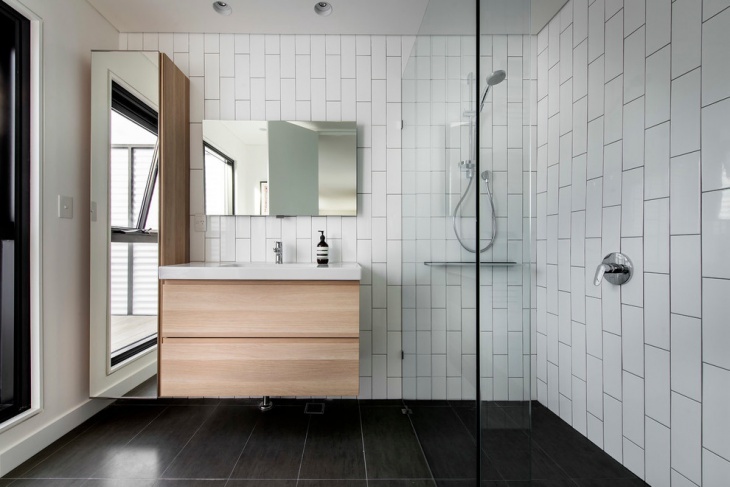 The black and white bathroom with shiny tiles on the floor look gorgeous. The wall mirrors further enhance the loo of the bathroom. 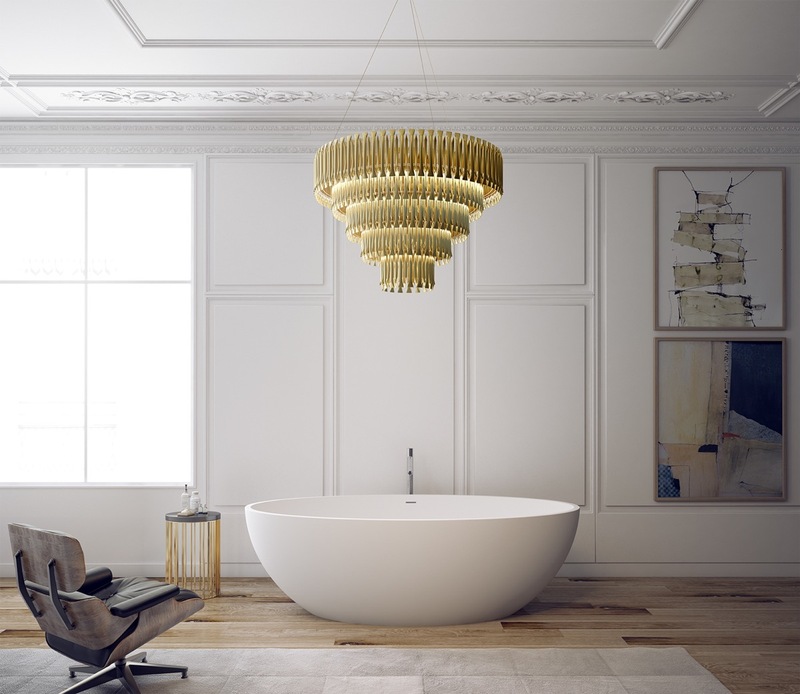 Install white tubs and other bathroom accessories, and these will go well with the shiny pendant lights on the ceiling. A tropical bathroom has cool bathtubs and you will get a beautiful interior if you have white-based polished accessories in it. 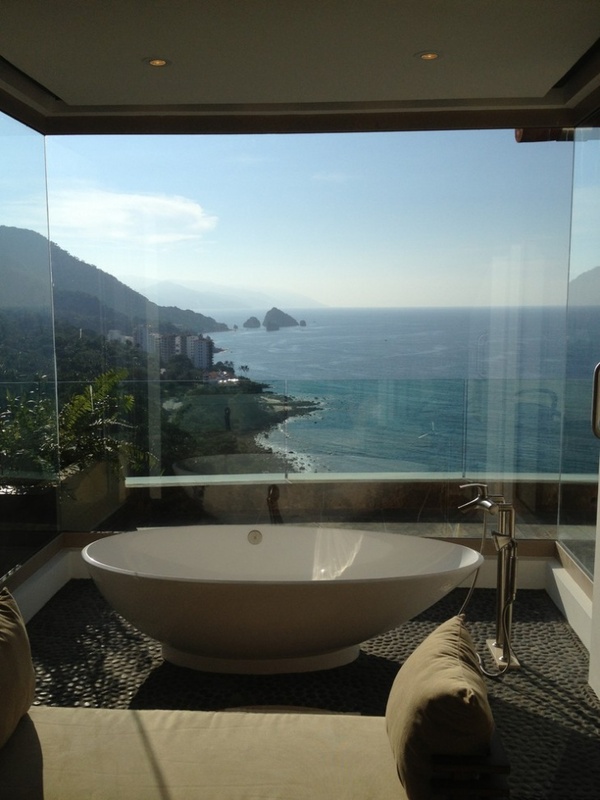 It provides with a good view outside, and the dark ceiling complements the bright interior in this particular bathroom. This is a comparatively new idea in the field of bathroom designing. There is a shower stall with walk-in closet designs. The frameless shower door slides open and this gives the bathroom a sophisticated look. 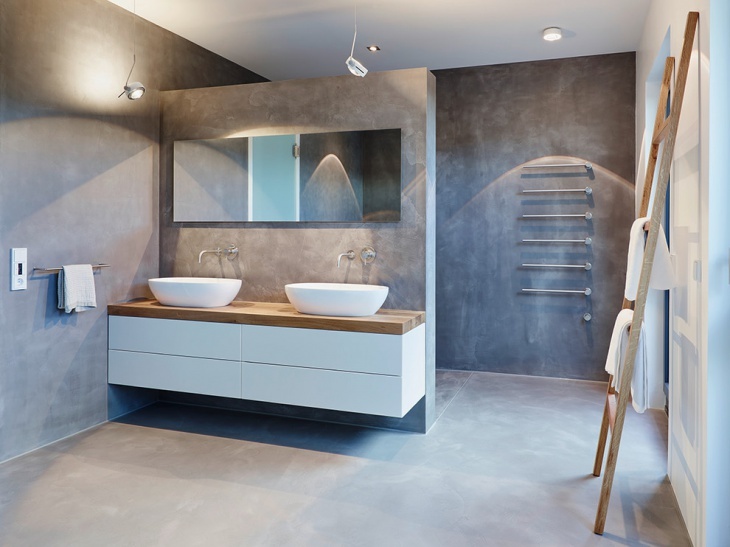 Opt for the grey and white colour contrast for the bathroom. 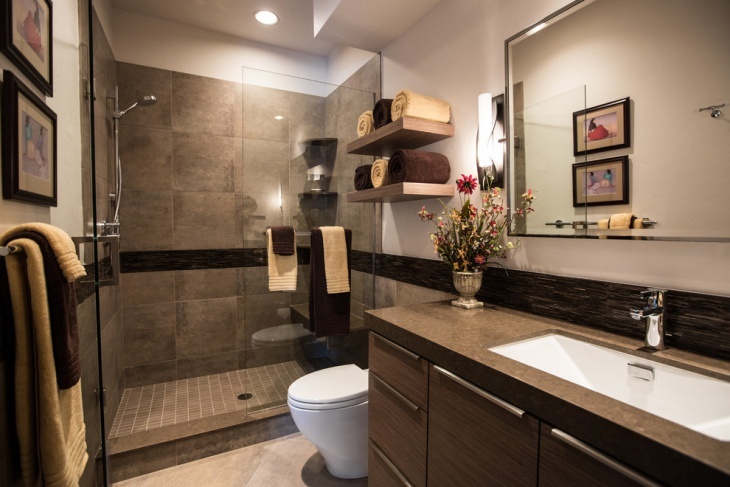 Use brown tiles of different shades and sizes in the bathroom to deliver a contemporary look to it. There are elegant looking bathroom shelves in it, and you will find cream-brown walls ideal for the bathroom. With white porcelain sink and dark vanity in the bathroom, you will get a classy interior with this setting. People with a sophisticated housing taste will find brown square tiles ideal for the bathroom. It comes with a tub to shower conversion kit. The mesh speaker doors add a higher degree of elegance to the settings. 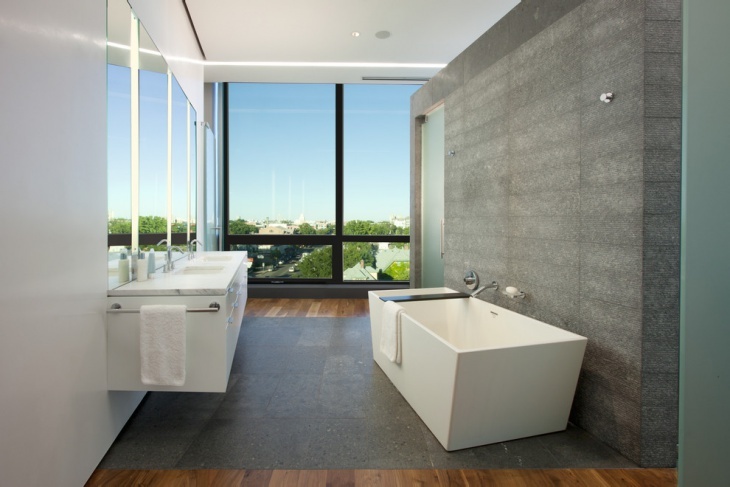 In case you want to customise your penthouse bathroom, you can choose a specific theme. There are different designs like beach bathroom, industrial bathroom, eclectic bathroom,small bathroom designs and other variations. You may come up with your own innovations as well, and you are free to let us know about what you innovate for your home.